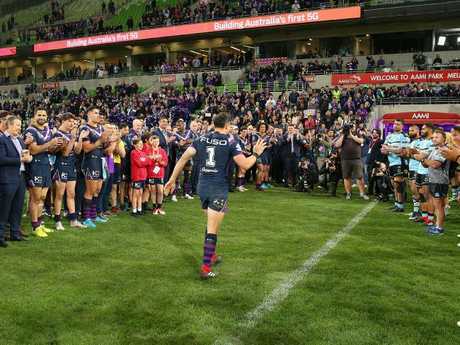 MELBOURNE superstar Billy Slater's grand final fairytale could be over after reports on Saturday morning that the NRL has charged him with a grade one shoulder charge offence. 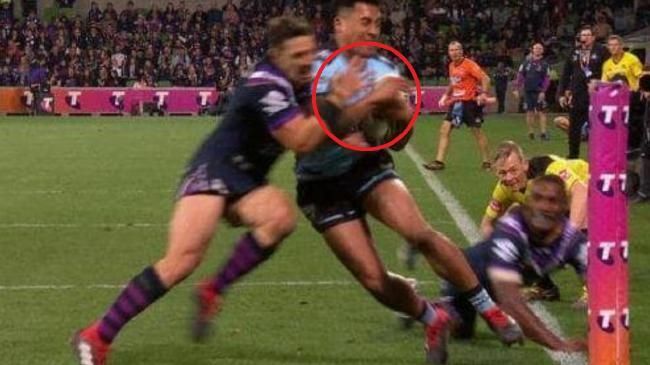 The NRL is expected to confirm on Saturday that Slater will serve a minimum two-week suspension for his controversial tackle on Sosaia Feki - an offence that carries a minimum 200 demerit points. Legends, including Andrew Johns, Johnathan Thurston, Brad Fittler and Peter Sterling told Channel 9 that it didn't look good for Slater - under the current rule interpretations surrounding shoulder charges. A charge would attract 200 demerit points, enough to rule him out of next Sunday's decider. The former Kangaroos and Queensland fullback would need to successfully fight the punishment at the NRL judiciary to have any hope of ending his career in the ANZ stadium showpiece. 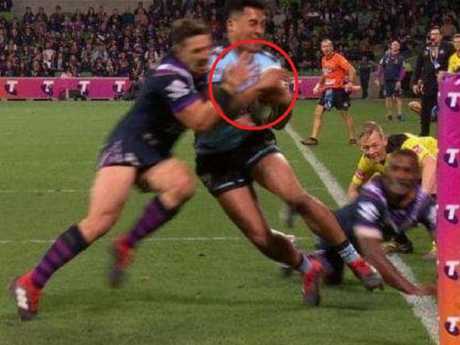 TV replays showed Slater's right arm briefly hovered near the ball in Feki's hands - potentially proving the star fullback was trying to execute a tackle and did not negligently smash Feki with his shoulder. Cronulla coach Shane Flanagan agreed in his press conference after the game, declaring Slater should be allowed to play because of his hand position. It would be the cruellest way to go out.